Viral Ferguson hug photo staged? 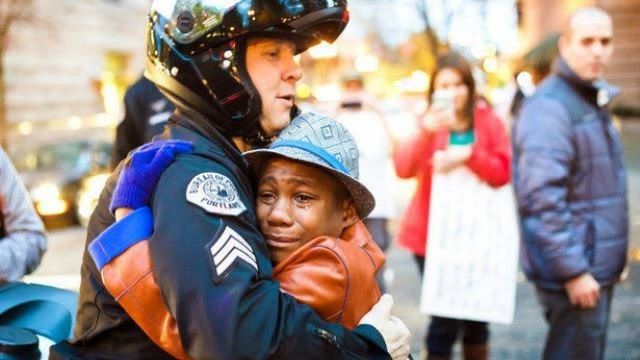 That is the question many black people are asking days after the above touching photo of a white police officer hugging an emotional African-American boy went viral. Many are going as far as calling the image a white media propaganda to denigrate black protesters. The photo was taken at a Portland, Oregon protest following the St Loius grand jury ruling that no criminal charges would be brought against Officer Darren Wilson for the shooting of Michael Brown in Ferguson, Missouri this past summer. The boy turned out to be 12-year-old Devonte Hart, who had attended the rally with his parents in support of peace and had been crying. He was holding a "Free Hugs" sign, and when Portland Police Sgt. Bret Barnum saw the boy's sign, he asked if he could have a hug. The boy gave him one, and the rest they say is now history. However, as more details and other photos of the hug come online, many are beginning to question if there was an ulterior motive behind the original picture and why the media was so quick to circulate the photos. Earlier, Devonte's mom Jen Hart had written on Facebook about the genesis of the photo, calling it, "one of the most emotionally charged experiences I've had as a mother." "He trembled holding a Free Hugs sign as he bravely stood alone in front of the police barricade. ... After a while, one of the officers approached him and extended his hand. Their interaction was uncomfortable at first. ... [Then] he asked Devonte why he was crying. His response about his concerns regarding the level of police brutality towards young black kids was met with an unexpected and seemingly authentic (to Devonte), 'Yes. *sigh* I know. I'm sorry. I'm sorry.' The officer then asked if he could have one of his hugs." It turns out that Jen Hart is a married white lesbian and her partner is also white while all their children are adopted and not caucasian. Many say the family and the cop in the picture are Darren Wilson supporters. These details have angered many black commentators and led to heated debates on social media, mostly split along racial lines. The debate started after another photographer, Alex Riedlinger, shared the two pics below from the same time, but before the viral picture, which he says was cropped to project spontaneity. The Oregonian had reported that Barnum said he had no idea he was being photographed at the time the moment occurred, and when he saw the now viral photo of the moment the next day, he was blown away. Alex Riedlinger two pictures tell a different story. In the first picture, Riedlinger says Devonte Hart is talking to his mother like she was coaching him before he approached Barnum and the second photo shows photographers preparing to snap the viral photo. 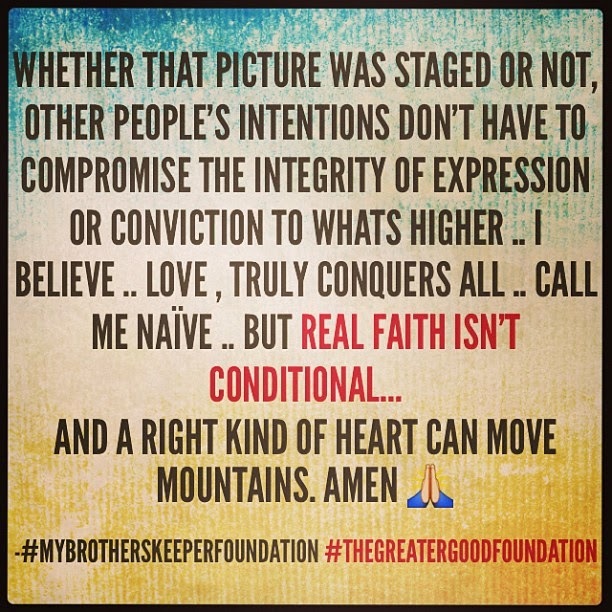 Another poster called out actress Meagan Good who had posted the earlier picture of the hug as a way to call for love and peace and this was her answer. good fix. But even the photographer says we've misconstrued the purpose and meaning of the photo. Also, hugs don't being back the dead. Beautiful, but still not a solution to the problem. Let's put some "love" in the policy. Some love in the way we see ourselves. This love needs to be bigger than police hugging children.